-With the useful carry handle, smooth zippers for easily and quickly opening. -Elastic bands keep the cords from falling out, even when shaken while the bag is open. -Separately-zipped sections and adjustable Velcro dividers provide excellent flexibility to maximize its storage space and keep items separated, easy to be found and ready to use. 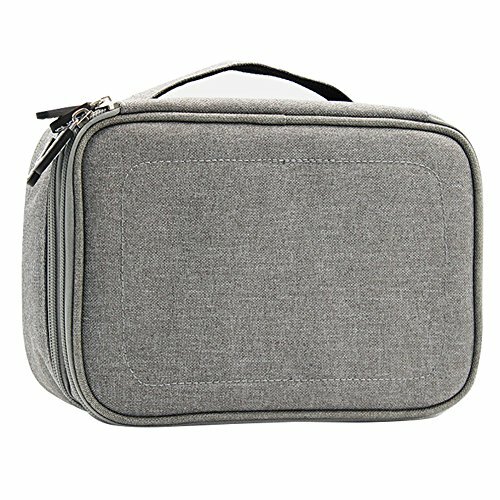 -Comfortably big enough for holding most of your electronics with ease, like batteries, chargers, USB cord, external hard drives, SD cards, iPhone, iPad air, iPad Mini, Kindle and other devices. -Material: Oxford cloth; Size: 23x16x8.5cm; Color: grey, black. Three padded Velcro dividers allow you to customize the compartment and make it easy to organize your portable accessories. Well padded semi flexible covers offer excellent protection for your accessories. Material: Oxford cloth; Size: 23x16x8.5cm; Color: grey, black.